Housing has slowed this year, but Meritage Homes continues to perform well. Leading homebuilder Meritage Homes (NYSE:MTH) released its third-quarter earnings this morning. While it came up 12% short of analyst expectation for earnings per share, the company still made solid progress in one of the tougher housing markets in recent years. Let's look at a few key items from the earnings release. While the EPS miss isn't great news, Meritage had some important accomplishments in the third quarter. Meritage Homes has traditionally focused on the western U.S., largely Arizona and California, but these legacy markets are tough right now. CEO Steve Hilton said in the earnings release that sales actually declined in the West, but recent expansion into the East -- largely the Southeast -- more than offset that drop. The company's Central and East regions respectively grew sales 31% and 53% in the quarter, driving the 13% increase for the consolidated business. The company will likely continue to grow outside of the West, especially as that region faces a number of challenges. Besides the decline in sales in the western U.S., the company also faces margin pressure, as increases in the cost of land is outpacing Meritage's ability to increase prices in western markets. Furthermore, there's just more demand growth in the Southeast right now. Early in the quarter, Meritage announced it would buy private regional homebuilder Legendary Communities, which operates in Georgia and the Carolinas along the I-85 corridor. This area is growing quickly, with Atlanta being one of the fastest-growing private home markets in the country. In short, this earnings release showed how important Meritage's geographical expansion is for the company moving forward. 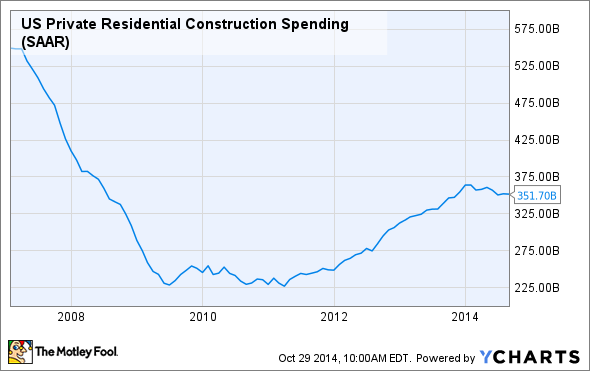 US Private Residential Construction Spending data by YCharts. However, it is still well off its historical averages, with current levels about the same as in 2000. While in many ways this is a trailing indicator, meaning it won't reflect a rebound until after the rebound has happened, Meritage continues to invest in growth. According to the release, the company owns $1.86 billion in land, up 32% from a year ago. The company more than doubled its active communities in the Southeast last quarter, largely through the Legendary Communities acquisition. While the legacy California and Arizona markets are challenging, the Southeast and Texas markets remain strong for Meritage. The company increased its overall average selling price in the quarter, though it was below levels seen earlier in the year. It's important to note that some of its properties in the Southeast will sell for much less than the average price in California. For example, a search on Meritage's website for homes below its average $358,000 price last quarter yielded 19 communities in Georgia, but only three in Southern California. The point? As the company moves east, the average sales price might even decline a little at some point, depending on the mix of sales. What's more important is that the company manages its costs and increases prices based on comparable sales, and not across the board. Meritage is also likely to make additional acquisitions. However, this means management must continue to manage its capital. Cash on the balance sheet fell almost $200 million in the quarter, largely due to the Legendary Communities acquisition; if Meritage intends to continue to expand, let's hope it can use cash flow and not debt to do so. However, if the right opportunity comes along, adding to the current $920 million in debt might be the only option. Meritage -- like most big homebuilders -- is operating in an environment that remains very tough. However, management has taken great steps to expand into new geographies with stronger demand, which will help the business significantly as the housing market finds its legs. Eventually the market will turn. When it does, Meritage will be ready. The market is likely to sell on today's news, but this is typical short-term thinking. Meritage is one of the best homebuilders out there.